I was on the “animation SWAT team” that came in at the end of “Pocahontas” to help finish the animation to meet the deadline for completion of the picture. 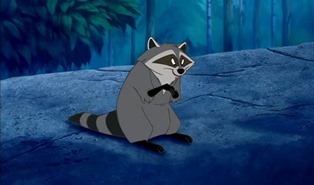 I animated primarily on Meeko. It was fun to work with directors Eric Goldberg and Mike Gabriel on this film. It didn’t have much to do specifically with my career making stone sculpture. However, working with these brilliant animators was completely inspiring. I think the more one works with great artists, the closer one may come to creating good art. I was lucky to work in a professional stone carving studio for a year, and learn from some very talented sculptors. Madeline Weiner and Vanessa Clark are among the sculptors there who really inspired me. “Nice View From My Tail” and “All Tucked In” are two of the stone sculptures I made that year.